Portland's pilot project with battery-powered scooters ends, but a second project may be in store for 2019. The proliferation of battery-powered "e-scooters" on Portland streets ended Tuesday, Nov. 20, marking the planned conclusion of a four-month pilot project. But those who have come to depend on the scooters for travel or recreation on city streets shouldn't fret too much, as the Portland Bureau of Transportation says it's considering a second pilot project for next year. PBOT staff plan to gather data and public input based on the 120-day trial period, then use that information to evaluate the project and perhaps frame a second pilot project. Or you can leave a phone message at 503-823-7483. 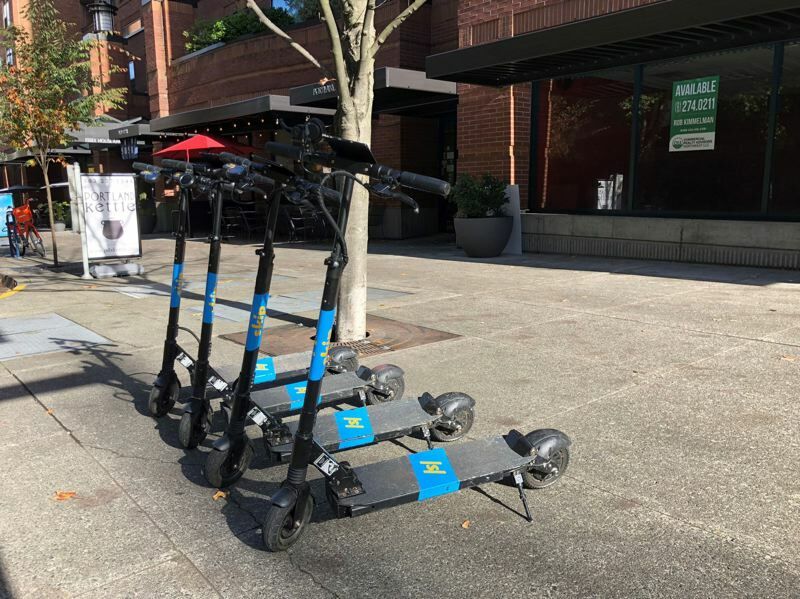 PBOT announced the pilot project in May, and three companies agreed to provide scooters: Bird, Lime and Skip. Combined, there were 2,049 scooters available for short-term rentals on city streets. The scooters operated much like bikeshare programs, and were available at dozens of places around the city for short-term, one-way trips. Users downloaded apps for one or more of the companies whose scooters they wished to rent on their smartphones. Then they picked up an available scooter found on the sidewalk and off they scooted, paying for it with their smartphone. Since the pilot project began July 25, PBOT says the scooters were used for 676,000 trips, covering more than 775,000 miles. PBOT required that the companies place a number of scooters in East Portland, to assure that part of the city was not underserved, and barred scooter use in parks and on sidewalks. While it was clear that many Portlanders took to the new technology, it was rare to see riders wearing helmets — which is required by state law. And it wasn't hard to spot scooter riders running stop signs and riding on the wrong side of the street.